Hello everyone, I'm a ritual beast player and I feel that Ritual Beast nowadaas is still strong, but that is, if you are able to get every game that small 17% chance of starting both Elder and Cannahawk/Rampengu. With that in mind, I was thinking, what does Ritual Beast needs to thrive once again and not be laughed of? Consistency and draw power. And with that in mind I set on a quest to make these 3 support cards for them. 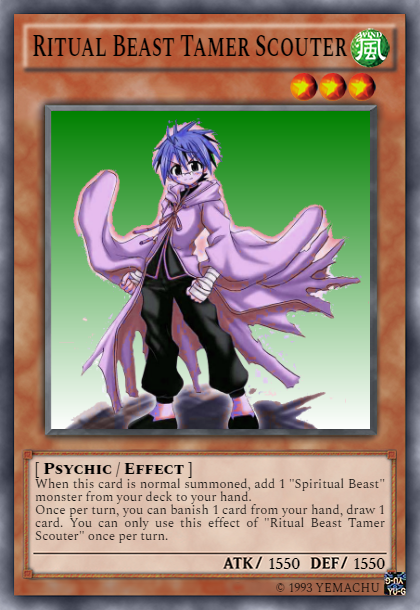 "When this card is normal summoned, add 1 "Spiritual Beast" monster from your deck to your hand. Once per turn, you can banish 1 card from your hand, draw 1 card. 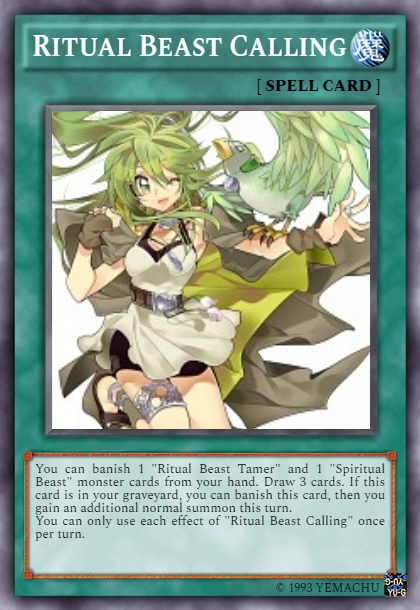 You can only use this effect of "Ritual Beast Tamer Scouter" once per turn." Now I will explain why would he be relevant and needed. Ritual Beast Tamers are kind of meh, with only Elder being a playstarter in the entire set, okay, you have a 33% chance of drawing Elder, but what if you don't draw a spiritual beast along with it? So with this in mind, I designed this card to fill that brick, suppose you draw only Tamers in your starting draw, with this card I can add of of the animals and to add with that, banish one of my dead draws to try and get another chance of getting a good card. 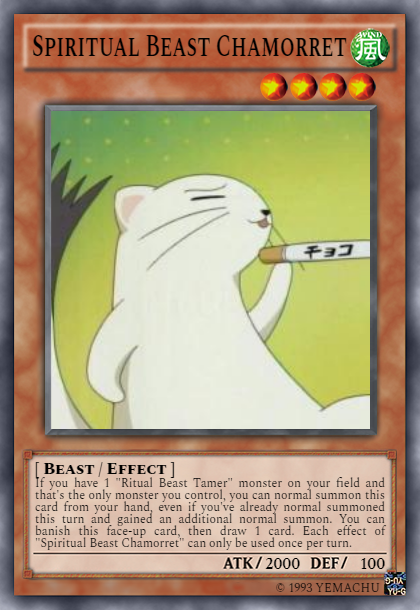 "If you have 1 "Ritual Beast Tamer" monster on your field and that's the only monster you control, you can normal summon this card from your hand, even if you've already normal summoned this turn and gained an additional normal summon. You can banish this face-up card, then draw 1 card. Each effect of "Spiritual Beast Chamorret" can only be used once per turn." This card was actually designed in mind with Scouter searching it, but it actually fills another weak point of the deck, being able to even summon your cards first turn, now imagine you drew something like 2 Laras or Zeframpilicas, even if you couldn't active their effects to special summon, if you draw this card alongside them, this is basically your chance to at least put something like Ulti-Petelfin and wait till you buy something better. His banish himself effect is made thinking of this cenario: you already summoned elder, or have something like brain research lab, you will have 3 monsters on the field, but you only need 2, so you get yourself 1 card for banishing this card, and then start ulti-cannahwalk comboes with this card in the banished zone already. And lastly, a support spell card. "You can banish 1 "Ritual Beast Tamer" and 1 "Spiritual Beast" monster cards from your hand. Draw 3 cards. If this card is in your graveyard, you can banish this card, then you gain an additional normal summon this turn. You can only use each effect of "Ritual Beast Calling" once per turn." And suppose you draw another dead cards currently for what you need, you can banish it to at least get ulti-cannahawk on the field and start a limited combo. Tough there's one important part, this does not combo with elder, it's just another generic normal summon, but if you've already extra normal summoned, you gain nothing.